Two things scare me in life. The first is any letter coming through the door with the Harp Logo on the envelope, and the second are dogs. The first, I can do nothing to avoid, but the second I try to give a wide birth as much as possible. My fear of canines has prevented me, on many occasions, to venture into quite a few gardens for fear of becoming the next tasty morsel of some overly-protective mutt. I do not know how postmen do their jobs. On my way to work every morning, I have noticed one particular garden which has all the hallmarks of being inhabited by a wolf-like creature, but I have never seen one at the premises. I have therefore slowed the car to a near stop, lost my nerve, and then continued on my way. I know this sounds completely irrational, but there you go. Last Tuesday, my curiosity got the better of me, and instead of driving by the garden, I swung the car into the wide driveway and sat there, looking around me. I am glad I made this decision and it amuses me to this day how a whim can quickly become a great gardening surprise. There is nothing quite like a mature garden. I have said this many times, but when you are buying plants in their small two litre pots, its difficult to imagine what the shrub will look like in 10 or 20 years time. Before choosing plants for your garden, always take the time to visit mature gardens to see the plant in it’s natural environment. As I sat in the car, waiting for the inevitable appearance of an angry hound, I had a good look around and it took my brain a few minutes to process the sight before me. Whoever this gardener was, he or she certainly knew what they were doing. The garden was presented in the most wonderful manner. There were “cubby holes” of planting and open spaces everywhere. The garden was split up into a myriad of different areas, each one bearing a centre-piece to draw the eye. As I perused the delights, the front door of the house, which was framed by the most spectacular pots overflowing with vibrant red begonia’s, opened and a smiling lady stepped out and walked towards the car. I alighted and introduced myself to her and the lady, Carmel Murphy, offered to show me around. “We began planting this garden around 16 years ago”, she tells me. “When we first got here, the garden was a wilderness, but my husband Michael and I began to shape the garden to what you see now”. There is a fantastic mixture of Perennials, Evergreen and Deciduous shrubs and Conifers. The placement of the conifers is perfect, and it is as if they were planted first, and the rest of the garden expanded outward from each of the plants. At the back of the house, the garden extended further into the tall trees surrounding the property, giving the impression that the house was in a forest clearing. There, in one of the clearings, was yet another outstanding example of my favourite tree, the Cornus Contraversa, or Wedding Cake Tree. To the left of the Cornus, sat a huge example of a rare Fagus Sylvatica Dawyks Gold golden Beech Tree, It’s golden foliage shining in stark contrast against the conifers around it. This garden was not planned in any structured way, it just happened. Sometimes this is the best way to approach a large empty space. Sure, keep in mind the fact that you would like to split the garden into certain spaces, but do not take it too seriously. “I just planted the plants that I liked”, Carmel tells me, “Just plonked them here and there and I have been lucky with the results”. I agree with her, as we walk together past every example of shrubs and trees that you could possibly plant in the west of Ireland. I ask Carmel where she got the interest in gardening. 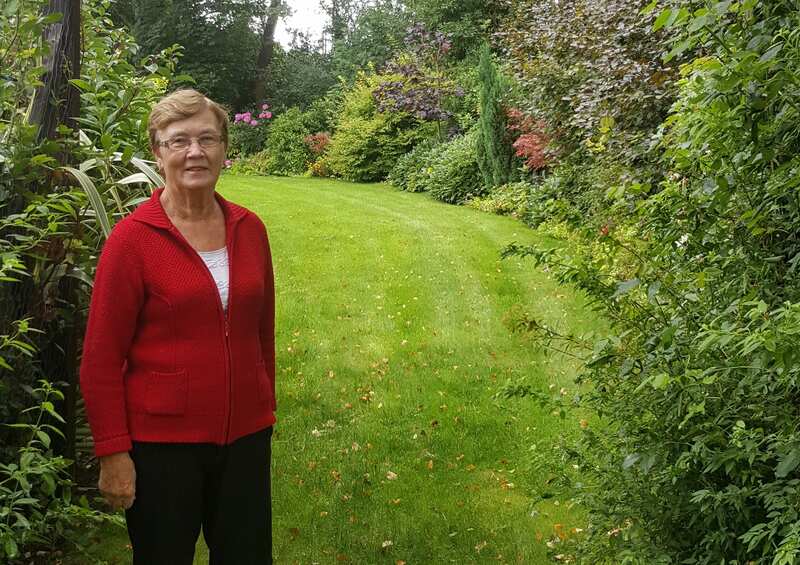 “I supposed I became interested in plants from the age of three”, laughs Carmel. “My mother probably knew that I would be a gardener, because she named me Carmel and Carmel comes from the Hebrew word for Garden!”. I have yet to see a garden that marries Coniferous planting with Deciduous planting in such a fine manner. Everything works perfectly. I can only imagine what the garden must have looked like in the height of summer but, because there are so many examples of plants in the garden, both evergreen and deciduous, the garden will look amazing all through the year, including Winter. Carmel tells me that when word got around about her garden, wedding photographers began to ask permission to use the garden for their wedding photographs. Carmel talks to me about the plants as if they were her siblings. She clearly loves the plants and loves gardening and her golden touch is visible everywhere. I get tired of hearing folks say that it is impossible to do any meaningful planting in the West of Ireland and Carmel’s garden is yet another example of what can be achieved in a wet and windy field with some good rain-gear, a passion for plants, and not taking yourself too seriously!